It’s nearing the end of September and I am still not sure if I have quite come to terms with the fact that both of my babies are now at school. For the last seven years and eight months I have always had a wee side kick at home with me on my days off work and I am trying to get used to the fact that this has now changed. Max returned at the start of September as an experienced P4 pupil (with longer days and more homework) while Lucia is a brand new, sparkly P1. I had been trying not to think about all of this too much over the summer and then, all of a sudden, the time had come and Daryn and I were walking our two little ones into school by the hands. Now, when I say I had been trying not to think about it all, obviously I had to do a little bit of thinking as we were trying to sort out Lucia’s compression (see my last two posts) to see if it was possible to get her some red garments to match her school uniform. For so long we didn’t think this was possible and were deliberating whether to dress her in trousers instead of a pinafore and tights, to put red leggings over her garments or to just try and settle for white ones. In the end, Juzo came through for us amazingly and Lucia is now wearing the colour ‘Cosmic Coral’ in the Expert range every day to school. They match her uniform to a tee and she absolutely loves them! When she first saw them she shrieked ‘they’re red!’ with the biggest smile on her face and we can tell she feels so special and proud to be wearing them. Most of the girls are still wearing white knee socks but this doesn’t phase her at all as she is so used to wearing her tights and she just simply loves the fact that these match her uniform. As for school shoes she is rocking a lovely little pair of black Converse! We looked into ‘proper’ school shoes but knew that it was unlikely we’d find a pair to fit. So instead we got her black Converse, changed the white laces to black and she definitely looks like the coolest P1 around! We are really fortunate that the school Max and Lucia attend is, quite simply, wonderful. This is the same school Lucia attended nursery at last year and the level of care she received was outstanding – the teacher really went above and beyond the call of duty in every way. Check out previous posts here and here. We are very thankful that this is now being followed on for P1. We know that Lucia’s garments are being checked and adjusted on a half hourly basis, that she has someone to help her with toilet trips, put on her outside trousers at break time and lunch time, she is supervised from a distance in the playground in case she has any falls (she’s had two already but all ok) and is watched going up and down stairs for any trips. We also put together a small first aid kit with savlon cream, steripods and mepore dressings for the teacher to keep in the classroom and to take out on any excursions. She also has brilliant emotional support as well as this practical support and it has eased our worries about the P1 transition hugely. P1 is a huge step up from nursery with twice as many hours per day which is a lot for little four year olds. They are currently building up to the five hours and Lucia has actually been off sick a few days already (schools are a never ending source of germs, Max has had an eye infection too!) so she has only just completed a full week and was shattered! So we are still adjusting to this new routine and at the moment still working out how to schedule in her vital therapy around school hours, school runs, work, homework, swimming, football and other clubs as well as the non-stop busy day-to-day life in general. Because Lucia has been ill a few times over these last few weeks including lingering colds and coughs we haven’t been able to carry out her therapy, so we still need to figure out just when this will happen each day. Right now I really feel like there isn’t enough hours in the day – but we will have to find them. During the week, afternoons will be the best times for doing her Physio Touch therapy as we have found if we use it before bed she tends to be more tired in the morning – which isn’t good for early school starts. However, we are still very much finding our feet and trying to get this new routine sorted, so things haven’t quite fallen into place just yet. 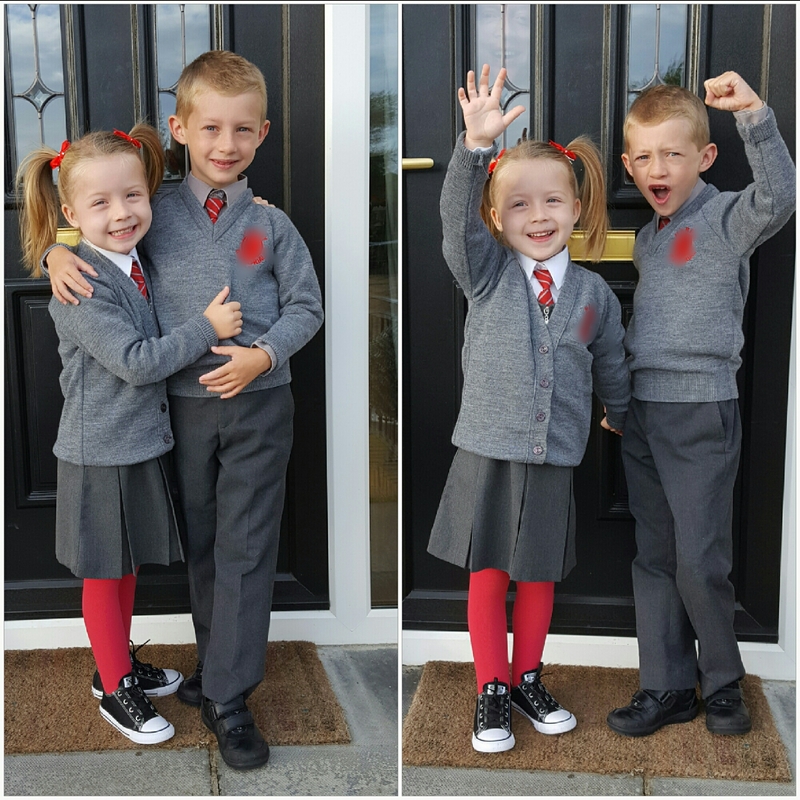 Overall though school is going well for both Max and Lucia so far and seeing them dressed in their matching uniforms and heading off to school makes us so proud each morning. Max is loving having his little sister at school (except when she blows him kisses in the corridor!) and has been doing the big brother thing by checking up on her in the playground and in the lunch hall which melts my heart. It has been a big change for all of us and we are all learning how to adapt to this new way of life – we just need a little more time to get there. Wow what lovely pictures so very cute. How beautiful does she look in those tights they match so perfectly and the converse look very cool!